DEARBORN, Mich., March 8, 2016 – It’s one thing to buy a fire-breathing, 526-horsepower Shelby GT350® Mustang, and it’s another thing to understand how to really drive it. 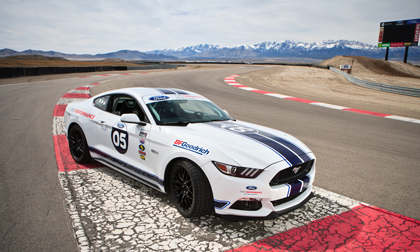 Owners of 2015 and 2016 Shelby GT350 and Shelby® GT350R Mustang are invited to learn the capabilities of their car as part of the complimentary GT350 Track Attack program offered by Ford Performance Racing School, located at Utah Motorsports Campus in Tooele, Utah. The program is designed to help drivers at all skill levels understand the nuances of their car’s performance and handling in a safe environment under professional supervision. The experience not only teaches high-performance driving skills, including braking, shifting and cornering techniques, but also focuses on the particular dynamics of the GT350 and GT350R. The GT350 Track Attack program begins with an evening reception followed by a one-day performance driving school. Students will participate in both classroom and on-track driving tutorials with Ford Performance Racing School instructors. The program is included with the purchase of a 2015 or 2016 Shelby GT350 and GT350R Mustang, on sale now in the U.S. and Canada. While the one-day drive event is complimentary and owners do not need to bring their own car, they are responsible for their airfare and lodging. For a cost, participants can opt for a second track day, as well as additional driving and non-driving programs. Participants are encouraged to bring a guest along to watch. For an additional cost, they can get behind the wheel of one of the school’s race-prepared 2015 Mustangs, or extend their experience another day to drive a race-prepared Boss 302 or Mustang GT. For more information about the Track Attack program, visit www.gt350trackattack.com/. Ford Motor Company is a global automotive and mobility company based in Dearborn, Michigan. With about 199,000 employees and 67 plants worldwide, the company’s core business includes designing, manufacturing, marketing, financing and servicing a full line of Ford cars, trucks, SUVs and electrified vehicles, as well as Lincoln luxury vehicles. At the same time, Ford is aggressively pursuing emerging opportunities through Ford Smart Mobility, the company’s plan to be a leader in connectivity, mobility, autonomous vehicles, the customer experience, and data and analytics. For more information regarding Ford, its products worldwide or Ford Motor Credit Company, visit www.corporate.ford.com. Ford Performance Racing School, based at Utah Motorsports Campus, is a state-of-the-art road racing school that offers multiple road, track and off-road courses, hundreds of acres of space and a highly trained staff of professional drivers and instructors. For more information regarding the Ford Performance Racing School and its products, please visit http://www.fordperformanceracingschool.com.